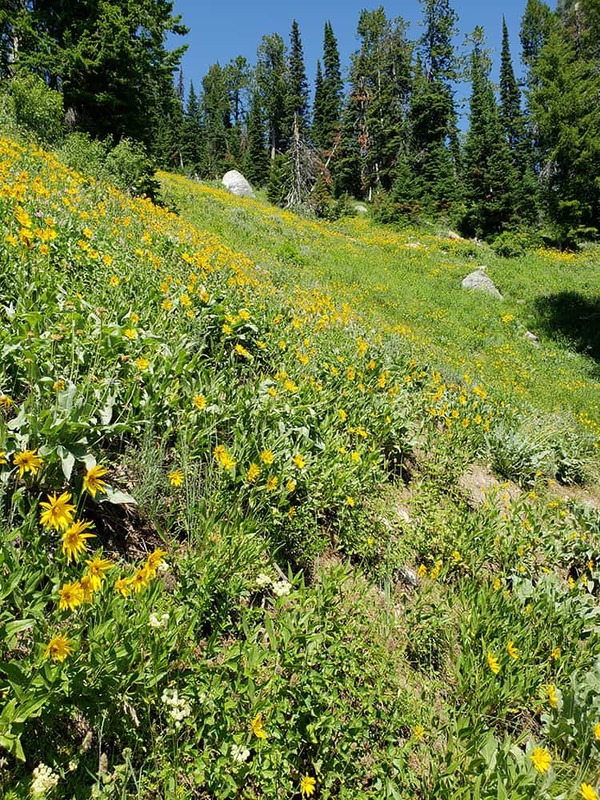 The high country of Grand Teton National Park is an amazing place, with dramatic scenery and immense ecological importance. I just backpacked to some of the high alpine lakes near 10,000 feet beneath the Grand Teton. The scenery is dazzling, but the condition of the forest is quite worrisome. The hike up from Lupine Meadows is not particularly long, but quite steep, ascending 3000 feet in under five miles to Amphitheater Lake. The main trail is surprisingly heavily trafficked, particularly in the middle of the day. At the top, mornings and evening are quiet. Night is complete solitude. The trail zig-zags back and forth through many switch-backs through fields of wildflowers before entering the high altitude forest. Eventually the trail levels a bit as a small plateau is reached beneath Grand Teton. 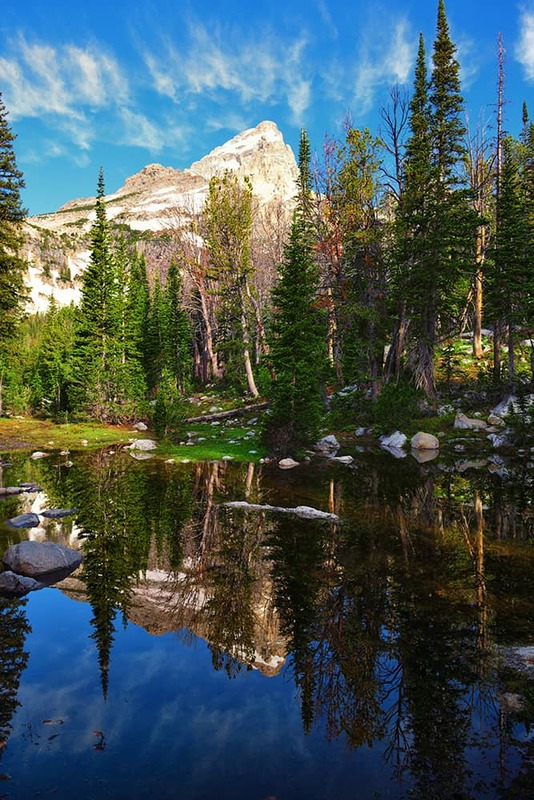 There are three lakes in the forest of whitebark pines. Surprise Lake is indeed a surprise after miles of steep terrain. Although July, there is still snow remaining from winter. The sound of rushing water permeates the forest as early summer snow melt continues. Dawn along the lake is calm and spectacular. Amphitheater Lake is a short distance uphill from there, at the base of Disappointment Peak beneath the Grand Teton. This panoramic view shows the granite amphitheater, with Grand Teton emerging into view above the foreground mountain. Mt. Owen is to the right. The trail to Delta Lake is closed to allow for re-growth in the area. It was a significantly more challenging (and risky) trail. The lake is visible, however, from the back country campsites above Surprise Lake. 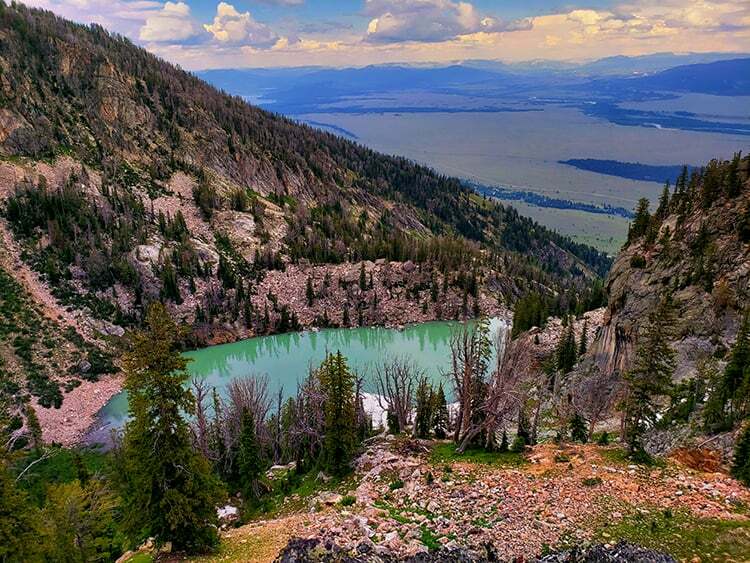 The beautiful teal water from Delta Lake is breathtaking, with a view down to Teton Valley. During my visit I did not see any bears. This forest used to provide one of the primary food sources for grizzlies in this ecosystem. 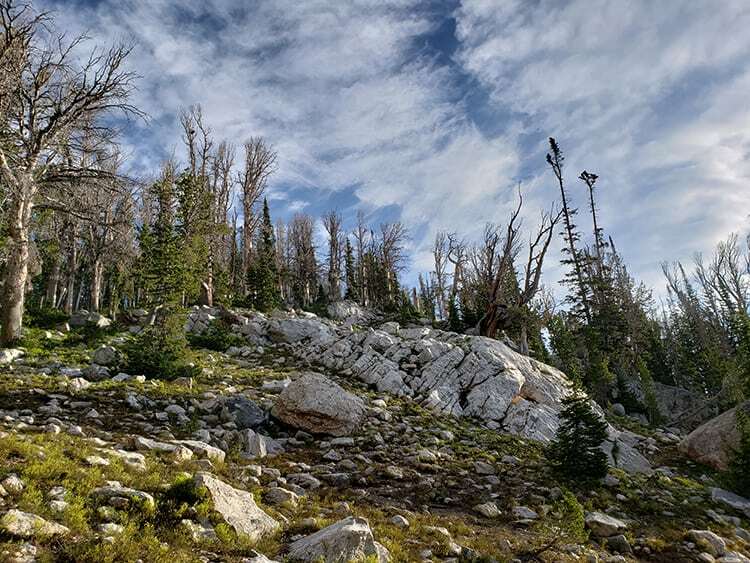 Whitebark pines produce pine nuts with a high fat content that help bears in the Greater Yellowstone Ecosystem fatten up for hibernation through the winter. Unfortunately, much of these important forests has been devastated by pine beetles. Climate change has allowed the beetles to reach elevations formerly too cold for them. The greatest insecticide of all – winter – has been diminished. 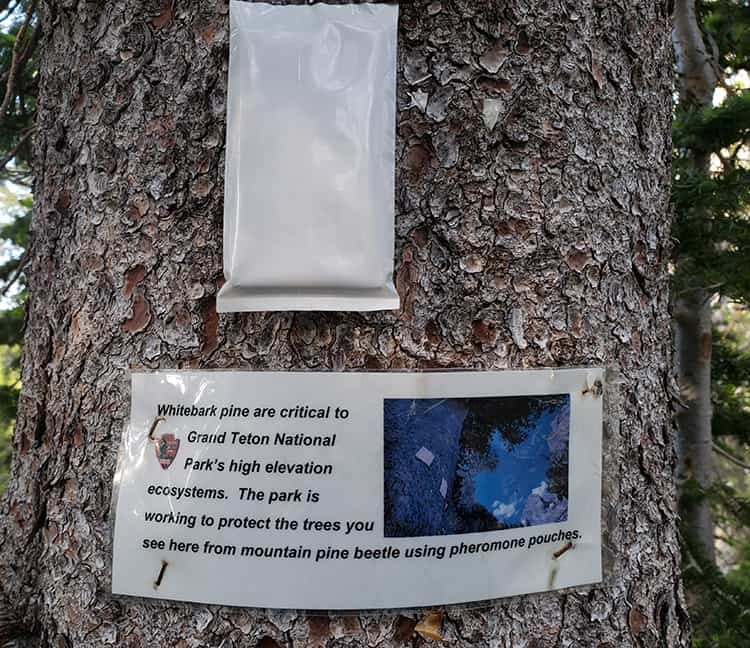 The NPS has placed pheromone packages on some healthy trees to prevent beetle infestation. While this effort is certainly appreciated, it is a band-aid on a major ecological wound. The increased spatial distribution of grizzly bears in the Greater Yellowstone Ecosystem has been cited as evidence the grizzly population is thriving. That inference is a fallacy. Unfortunately that conclusion is based more on politics than science. Grizzlies have lost one of their primary food sources and the population has spread out to survive. They are now more dependent on meat, and much more likely to roam areas with humans as opposed to the high forests that relatively few people visit. Our national parks attempt to preserve nature as it has existed for centuries and more. These ecosystems are nonetheless in peril and more should be done to protect the environment as well as the dependent wildlife. We are part of this ecosystem too, and ultimately depend on a healthy environment for our survival. 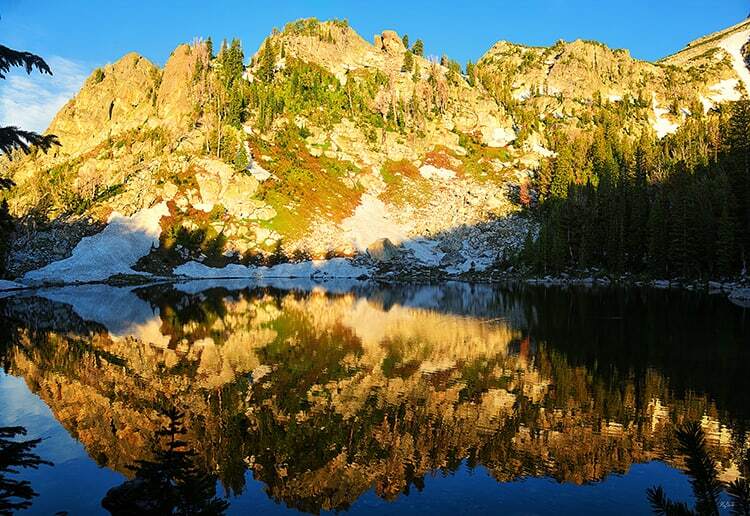 For those willing to undertake a steep climb and fend off the hungry mosquitoes, the hike to these alpine lakes is a great experience, as either a day trip or for an overnight stay. This entry was posted in Uncategorized and tagged Amphitheater Lake, Delta Lake, Disappointment Peak, Grand Teton, Grand Teton National Park, Surprise Lake, Teton high country, whitebark pines.